Biodegradable Reusable Poly Envelopes are made from acid-free polypropylene which contains an additional additive that allows it to biodegrade when tested according to the ASTM D5511. 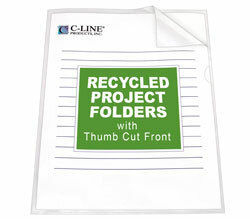 * For 11 x 8 1/2 document storage. Side loading. Hook and loop closure. Clear. 5/PK. * Learn about ASTM testing and the time and conditions it takes for these products to biodegrade. Incidental parts (hook and loop closure) are not expected to biodegrade.